If forex traders new the birth day of Mr. Forex specifically, they would surely celebrate it world wide, but unfortunately traders did not surely know the birth day of Mr. Forex. Still today forex traders do not know the birth date of the boss, Mr Forex. However, we know that Mr. Currency is traded in forex, Mr. Currency was born in ancient time. Before the birth of Mr. Currency, people used to practice Bartering, which refers to the exchange of one product for another e.g. rice for salt or rice for clothing. But the major disadvantage of bartering was that the process was not easy because all of the goods were not portable easily. To make the exchange of goods and services easy, people introduced the currency as the means of exchange. It is very hard to say how many form of currencies were introduced in the past history. The ancient modern form of currency was metal coins. When currency was introduced, every trade was taken place in exchange of currency. The remarkable advantage of currency is that it can be exchanged with any goods or services. Mr. Dollar is the currency of modern world. But before Mr. Dollar so many currencies were introduced and used as international currency. Following image are some of the currencies from history that were treated as international currencies. These are actually some lines from the history of currency, that is traded in forex market. Forex market was in action from the ancient time. 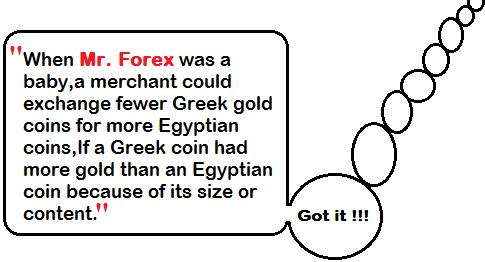 If a Greek coin had more gold than an Egyptian coin because of its size or content, a merchant could exchange fewer Greek gold coins for more Egyptian coins. This event took place when Mr. Forex was a baby. Most remarkable event from the history of forex was the introduction of “Bretton Woods System”, which was introduced after World War II to stabilize the global economy. It was a fixed exchange rate theory that set the exchange rates of all currencies against gold. In 1971 when the economy of different nations were forwarding at different speed, the “Bretton Woods System” was needed to be abolished. 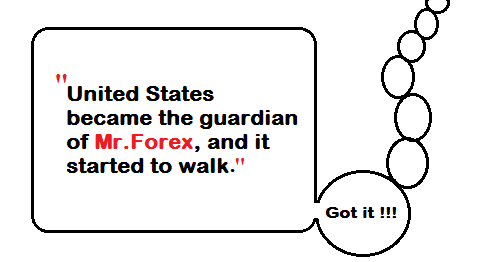 After “Bretton Woods System”, United States became the guardian of forex and forex market was started to walk. That time currency rates became floating, and the price of the currency was determined by the demand and supply. This was the starting of modern currency market. Primarily, determination of the value of a currency by the demand and supply was very difficult. But, thanks the the computer and Internet technology that made the currency valuation more easy. In 1990s banks started to develop their own trading platform to stream the live quotes to their clients. Mr. Forex started to run. Gradually, forex trading became a recognized business opportunity to the world. Some smart marketers created the currency trading platforms for the individual traders. So many forex brokerage firms entered into the industry to offer the forex trading opportunity to the small, medium and large scale investors. Today Mr. Forex is matured enough, it is now a market of 5 trillion daily turnover. Forex traders has more information at hand to trade the forex profitably than anytime before. Forex brokers providing competitive offers to attract new clients.Smart phone applications restlessly notifying the traders about current political, economic and other required information. Dear Traders, this is how Mr. Forex was brought up. If you have any questions, please drop a comment below.